Protect your hoses and improve the lifetime of your hoses by using Versatile Swivel System. Versatile swivel couplings are manufactured in the USA. They are made out of American sourced Aluminum and 316 Stainless Steel. PT Coupling swivel fittings feature Stainless Steel ball bearings for smooth motion and durability. The versatile swivel couplings can also be rebuilt in the field with swivel repair kits. 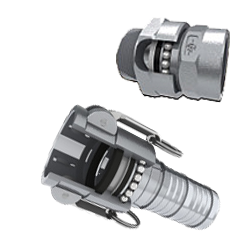 The versatile swivel has the same maximum working pressures as our standard cam and groove couplings. In addition the swivels require no grease. Protect your hoses and improve the lifetime of your hoses by using PT Coupling's Versatile Swivel System. What are the visible advantages of using swivel couplings?